We read with great interest the article “Validating the pachychoroid disease spectrum using multimodal imaging” by Ayachit et al. 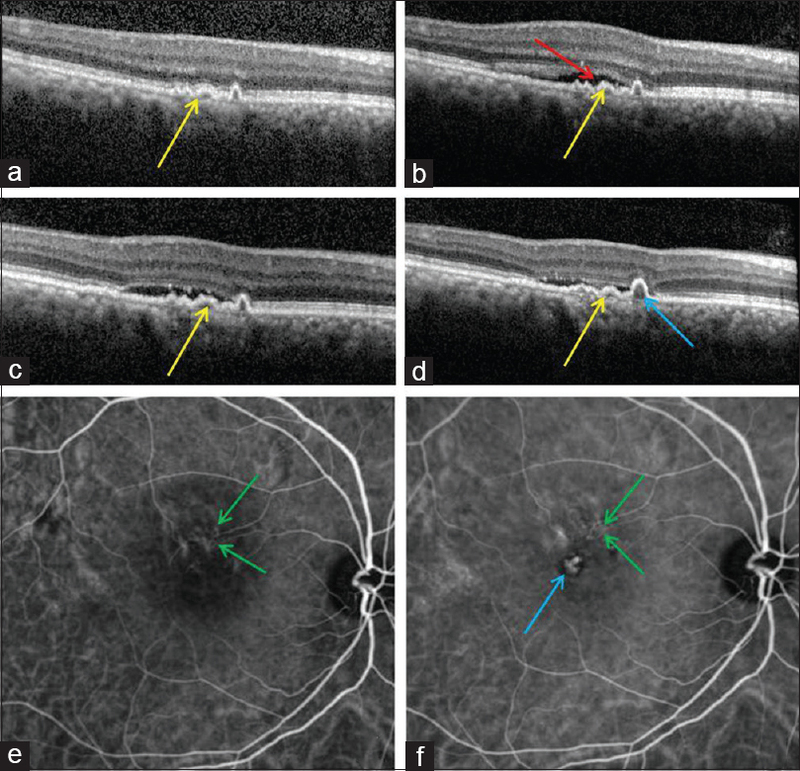 The authors describe multimodal imaging features of varied manifestations of pachychoroidopathy in a single patient and they should be commended for the same. One potential limitation of the current case, which has been mentioned by the authors, is the lack of one part of the disease spectrum, namely, pachychoroid neovasculopathy (PCN). We hereby report a 4-year follow-up of a case of pachychoroidopathy, who on presentation (2013) had features of pachychoroid pigment epitheliopathy (PPE) in OD in the form of retinal pigment epithelial abnormalities with absence of fluid and best-corrected visual acuity (BCVA) of 6/6 [Figure 1]a. 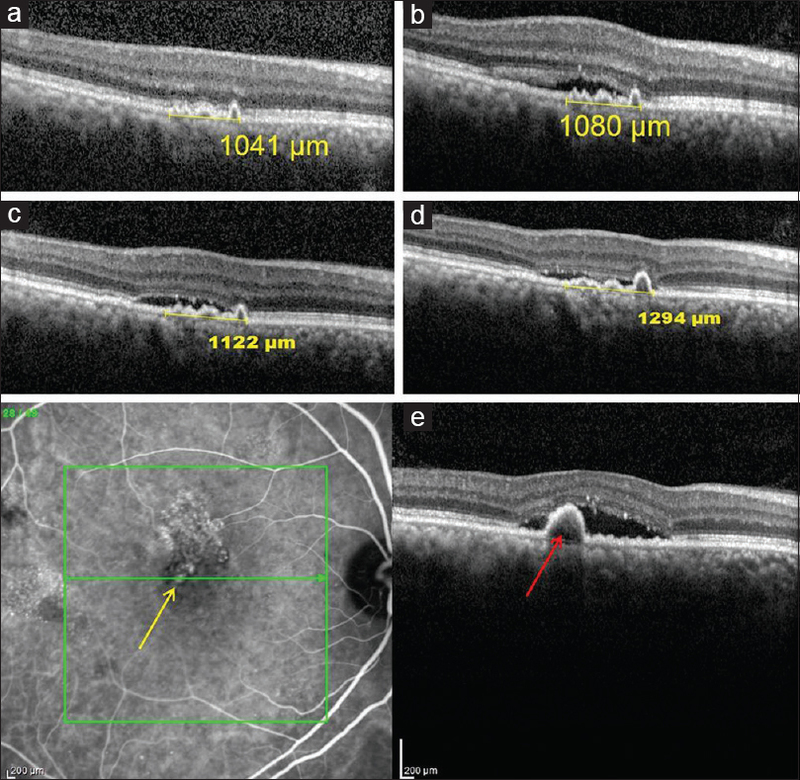 One year later (2014), he developed a serous macular detachment (SMD) suggestive of progression to central serous chorioretinopathy (BCVA 6/6) which was managed conservatively [Figure 1]b. Subsequently, in 2015, the patient presented with worsening of vision (BCVA 6/9). Spectral domain optical coherence tomography (SD-OCT) showed an increase in SMD [Figure 1]c, and indocyanine green angiography (ICGA) [Figure 1]e illustrated an abnormal vascular network in the absence of polyps suggestive of PCN. He underwent two doses of intravitreal bevacizumab (IVB), following which he was lost to follow-up. In 2016, he presented with further deterioration in vision (BCVA 6/12). SD-OCT showed worsening [Figure 1]d, whereas ICGA at this stage demonstrated classic early nodular hypercyanescence characteristic of polyp [Figure 1]f and [Figure 2]e. A diagnosis of polypoidal choroidal vasculopathy was made and the patient underwent three further doses of IVB. At all visits, we quantitatively noted a progressive increase in the dimension of irregular pigment epithelial detachment (double-layer sign) [Figure 2]a, [Figure 2]b, [Figure 2]c, [Figure 2]d.
To conclude, our case is complementary to Ayachit et al., as it further validates the pachychoroid spectrum. In addition, our case is exclusive as it illustrates the entire pachychoroid spectrum, including PCN, in the same eye over a longitudinal follow-up of 4 years. This highlights the importance of long-term follow-up of these patients on multimodal imaging, including timely performance of ICGA to detect any abnormal network or polyps which may help us plan pertinent therapeutic strategy for optimal outcome in pachychoroid management. Ayachit G, Ayachit A, Nadgir H, Joshi S. Validating the pachychoroid disease spectrum using multimodal imaging. Indian J Ophthalmol 2018;66:1022-4.